Dallas, TX – Deep Ellum Brewing Co. has released a new session IPA, Easy Peasy IPA. It will be available at DEBC distributed locations beginning June 22nd. 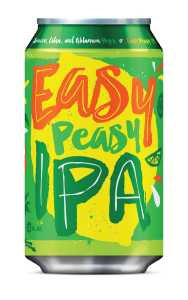 Beer Description: If there was ever an IPA made just for summer, our sessionable Easy Peasy IPA is it! Brewed with tangerine and lemon peel, and Pacific Northwest aroma hops, this is one juicy concoction you can enjoy year-round. Deep Ellum Easy Peasy IPA is sold only in 12 oz. cans. About Deep Ellum Brewing Co.
Based in the legendary blues-born and rock-raised urban district known as Deep Ellum, this trend-setting Dallas brewery creates smooth and assertive craft beers worthy of the area’ s eclectic heritage. Since the company’s founding in 2011, Deep Ellum Brewing Co. has crafted an award-winning roster of year-round, seasonal and limited-release brews, including Deep Ellum IPA, Dallas Blonde, Double Brown Stout, Four Swords Belgian Style Quad, Oak Cliff Coffee Ale, and this summer’ s newest addition — Easy Peasy IPA. To learn more about Deep Ellum Brewing Co. beers, retail availability and brewery tours, follow Deep Ellum Brewing Co. at Facebook.com/deepellumbrewing, Twitter.com/deepellumbrewco and www.deepellumbrewing.com.